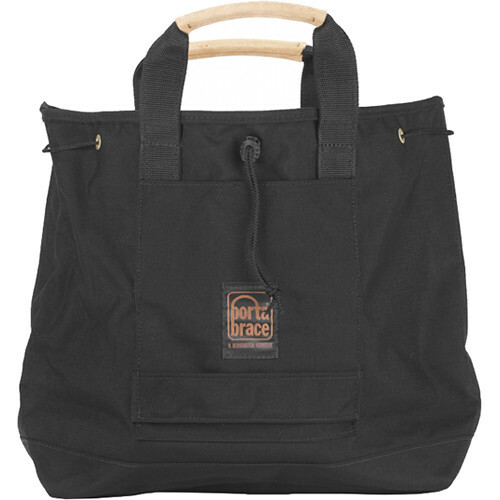 Interior Dimensions of 25 x 19"
Designed as an all-purpose tote bag, this large black Sack Pack from Porta Brace allows you to carry several lighting or photography accessories. It is made with a double layer of 1000-denier Cordura fabric and has a foam-padded bottom, making it more durable and well-suited for carrying professional equipment. The spacious main compartment of the Sack Pack features a height of 25" and width of 19", and can be easily closed with a drawstring for safe transport. Complementing it are two external slip pockets, one on each side of the bag, which can be used to hold everyday items for easy access. The tote is easy to transport thanks to its dual carrying handles, which merge in the middle via a soft grip for comfortable carrying. Box Dimensions (LxWxH) 13.5 x 9.7 x 6.3"
Sack Pack (Large, Black) is rated 4.6 out of 5 by 11. Rated 4 out of 5 by Daniel L. from It's HUGE. Everything Fits. This bag was way bigger than I thought it would be. You can easily fit 21 stands inside of it laying flat. I use this specifically to hold all of my stands, led lights, and accessories for my grip/lighting kit. It's absolutely huge. There's a slight pad at the bottom of the bag, but it's not super thick. Just enough to cut the edge off of hard drops. I'm giving 4 stars because I feel there could be just a little more support via padding around the bottom of the bag and the edges. This would help the bag hold it's shape better and stay open easier. This is probably too big for camera gear, but it's perfect for odds and ends and all things related to lighting or other set oriented things. I'm a videographer who makes youtube videos and I wanted something that would allow me to easily and quickly carry all my gear on location. This is one of the best and most flexible options. If you don't need huge, then I'd go for the medium version of this bag. There are 2 small pockets on the outside, they aren't big enough in my opinion. I put battery chargers in them. Don't let that sway you though. In the end, it's sturdy, well made, and a luxury tote bag. Rated 5 out of 5 by John H. from Portabrace - Quality Through and Through As an old timer in the video production business I've been using Portabrace products since day one. In my mind Portabrace is the default go-to product to store, carry and protect expensive video production gear. I have one small issue with Portabrace though. There doesn't seem to be a good way to label their blue canvas material. Because I hire freelancers there are multiple who use my gear. So it's important they know where things get returned to in each case, bag, etc. Any ideas or suggestions? Rated 5 out of 5 by Justin from I have looked a long time for this... If you know porta brace then you know how indestructible their stuff is, this bag is no exception. It is unbelievably useful for so many things. We use it for cables, flags, reflectors, laptops, wedding albums, sand bags... the list goes on. Rated 4 out of 5 by Anonymous from All Purpose Carry-all Use it to carry all manner of accessories; stands, clamps, padded cases, etc. Contents are readily accessed or concealed by means of drawstring. Also works great for non-photographic efforts. I like the fact that the shape is ambiguous and anonymous, unlike a formal camera carry case. Rated 4 out of 5 by Mike the AE from Great Large Bag Great bag for lights, cords and misc items. The only con is it could benefit from a shoulder strap. Otherwise a great durable bag that easily fit in the overhead space on a plane. Rated 5 out of 5 by Anonymous from A Big Bag It is a big bag. If you need a bag, this will work. It is very sturdy and well built. I have a few of them and end up using them on every shoot. I was surprised how much use I got out of these. Wish they had more colors but that is a very minor issue. Rated 4 out of 5 by Gunnar B. from Good stuff Great for throwing electrical cables, clamps and various bits in between locations when in a hurry.